I am replacing the Shifter Arm Seal on my Fordomatic. I have it apart on the Bench ( out of Car). Ready to re-assemble. 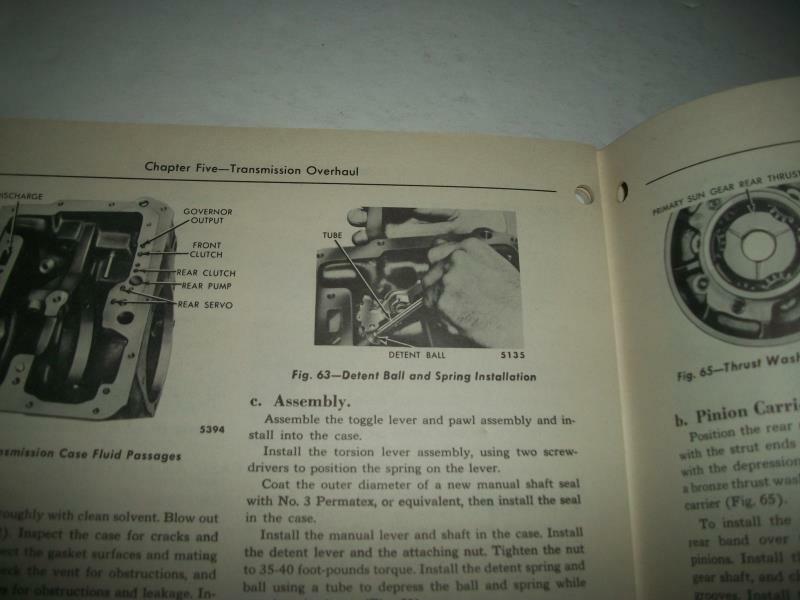 The Ford Shop Manual suggests using a piece of Tubing to compress the Detent Ball and Spring. Has anyone else found anything else that works better? Haven't tried it yet but the Ball disappears quickly if not compressed and held. Ask Me how I know. See the attached Picture from Shop Manual. I took a piece of thin strap iron, maybe about 3/32 thick and about 3/4" wide , bent one end 90 degrees and drilled a hole through it smaller than the ball. Pressing the ball in with it allows you to put the detent arm on. It's nice if you can get someone to hold the ball down while you use both of your hands to install the detent. But it is possible to do by yourself. Thanks for the Suggestion John. When I saw the Procedure in the Shop Manual I didn't think it would work. It does. I assembled the Manual shift Lever in the Case and turned it to clear the Hole in the Case where the Ball and Spring go. Used a piece of 5/16 Brake Line and carefully pushed the Spring and Ball into the Case and turned the Lever back to hold the Ball and Spring in Place. Took Me a couple of tries but got it done. If Anyone else is planning on do some work on their Fordo get a Shop Manual for the Transmission. Very useful. I replaced the 2 Seals in the Converter. One is the Cover Seal and the other is in the Center Hub. Also replaced the front Pump Seal, Support Bushing and the Pump to Case Seal. As well as the 2 Shifter Seals. I think this should fix my Transmission Leaks (hope).